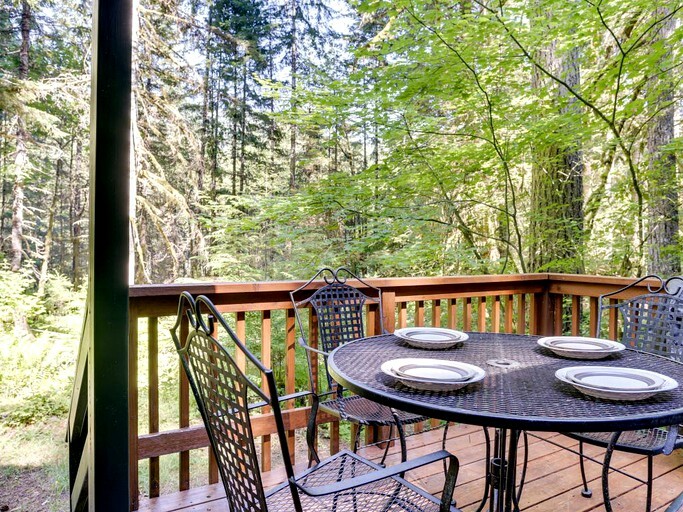 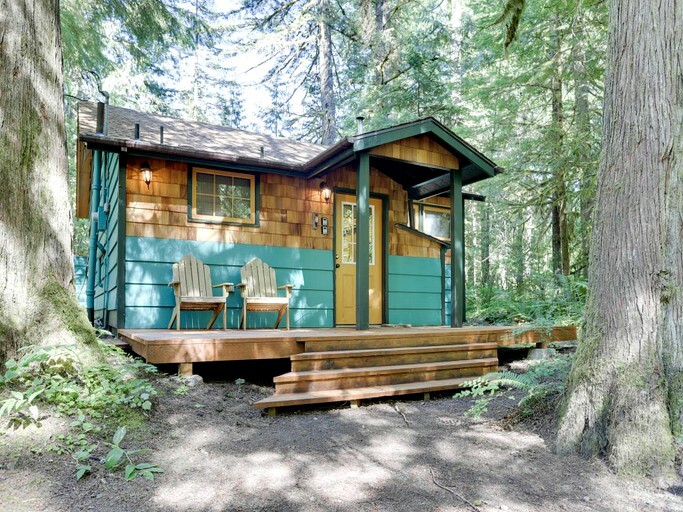 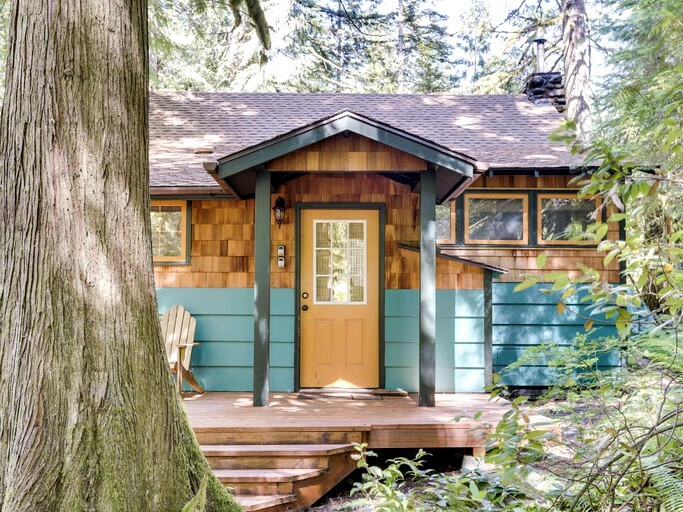 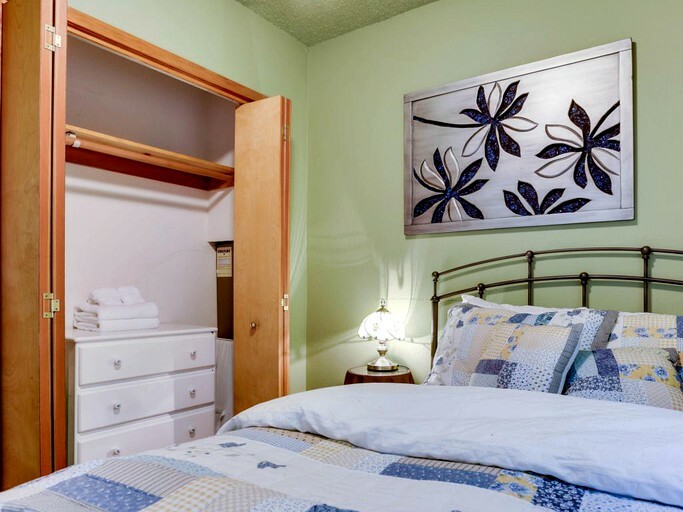 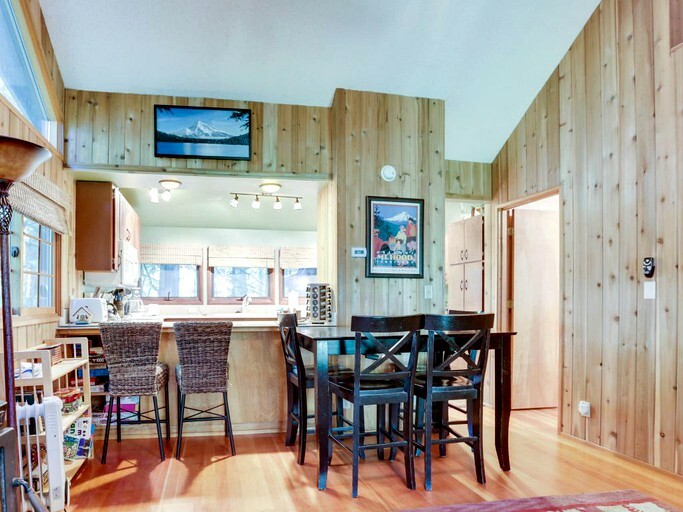 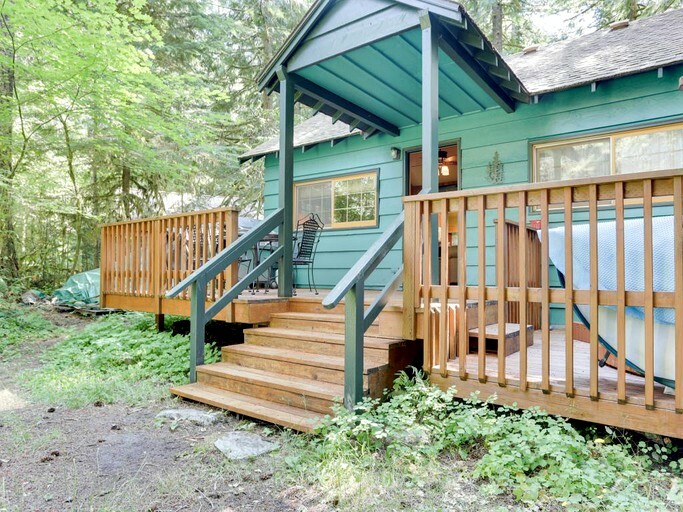 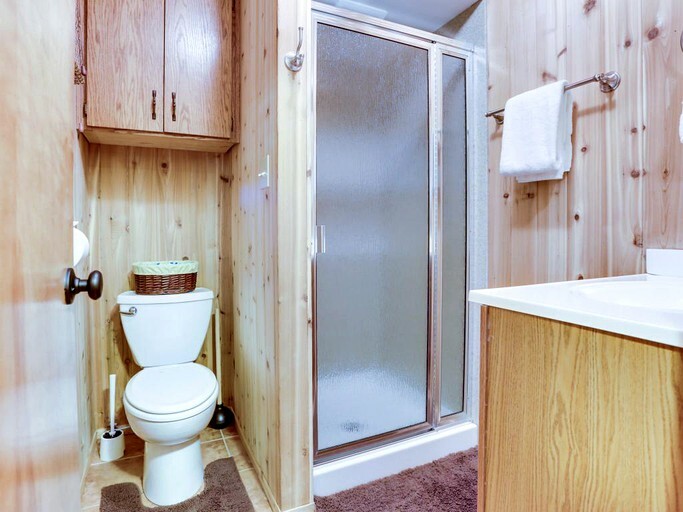 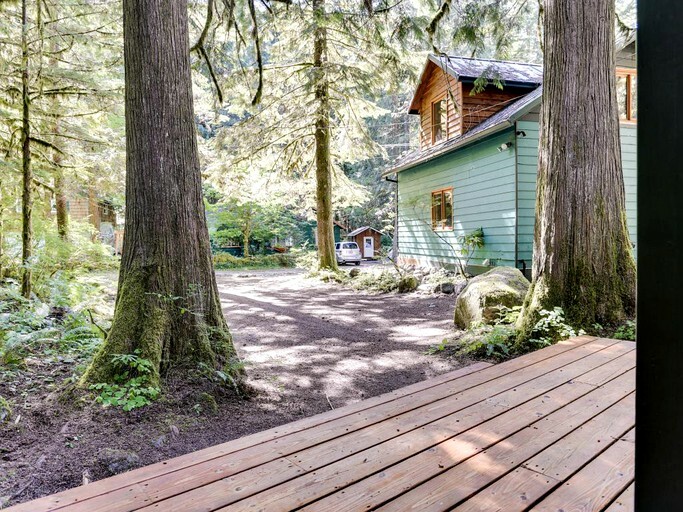 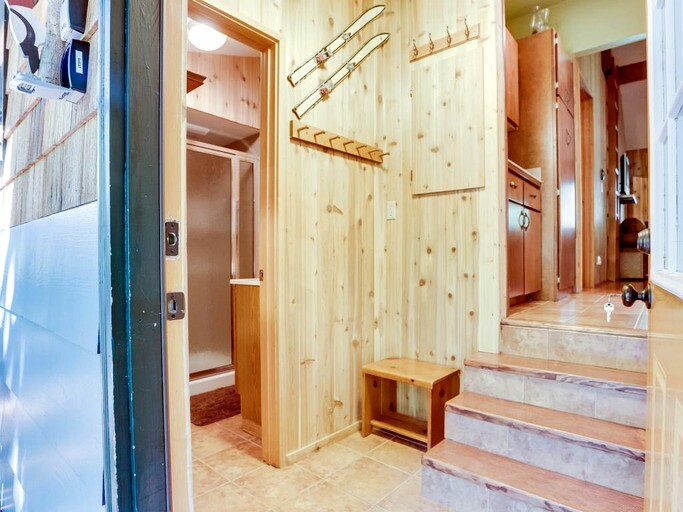 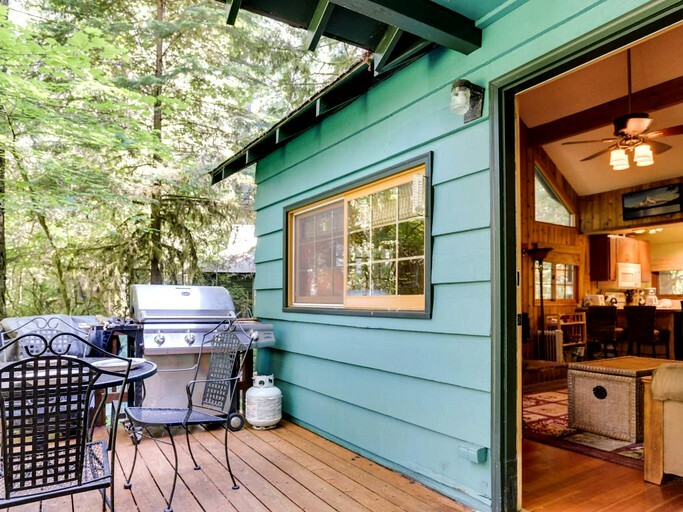 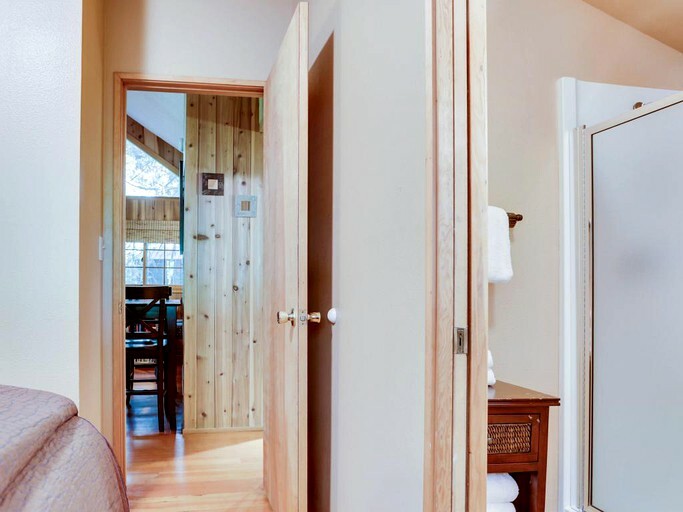 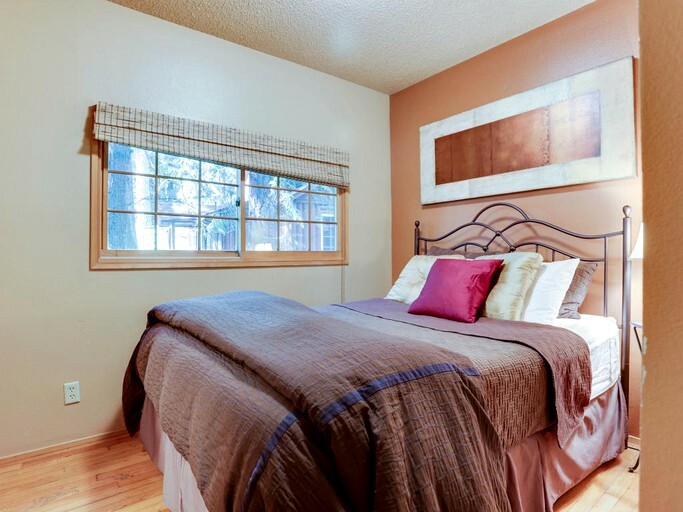 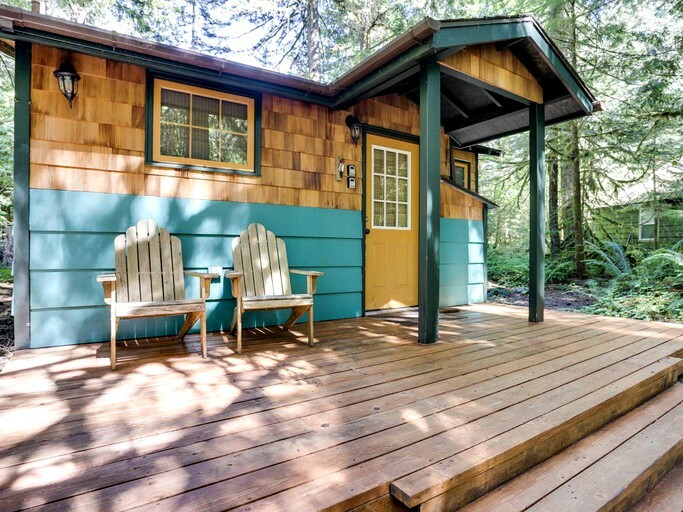 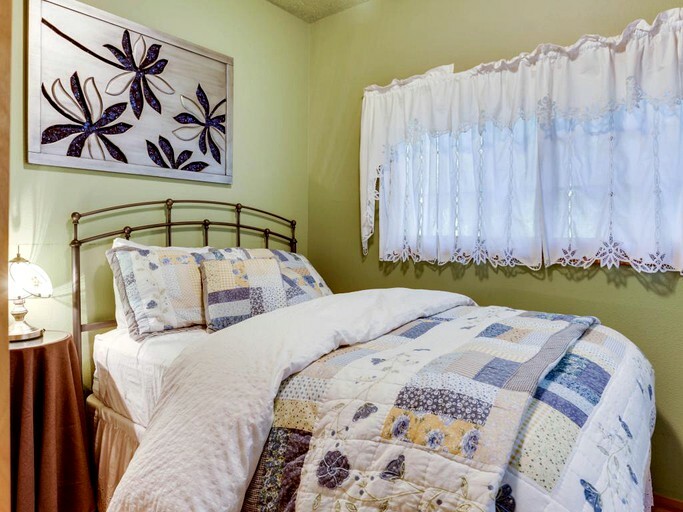 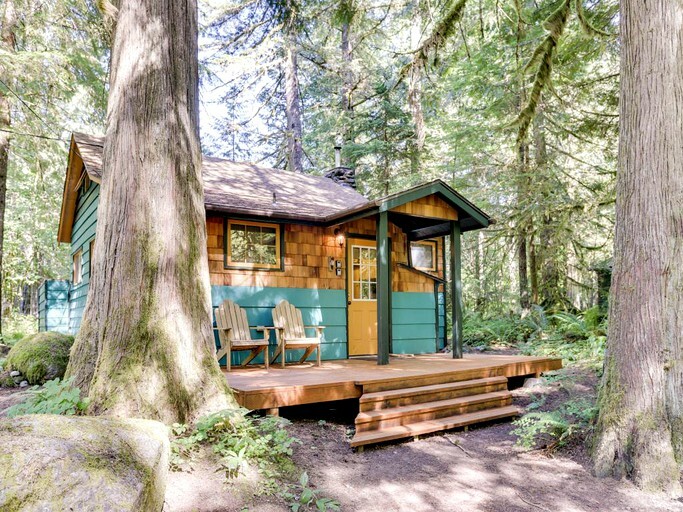 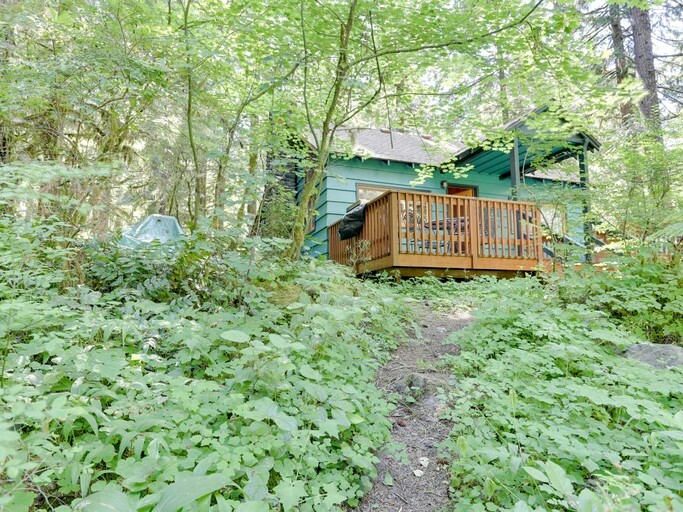 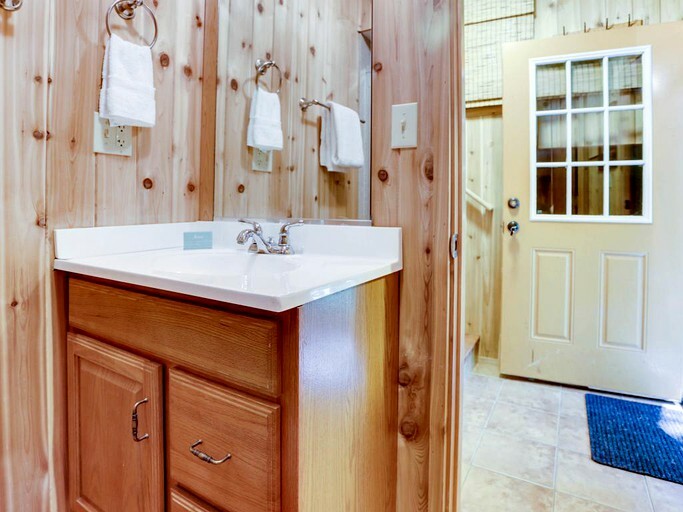 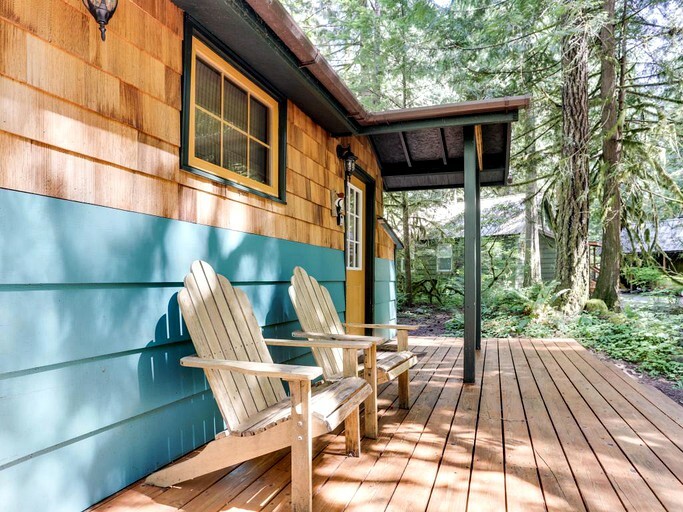 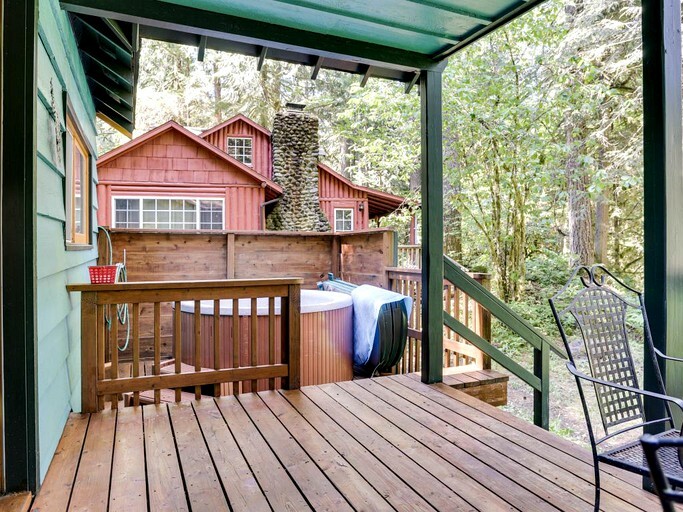 This cabin has great amenities and tasteful details, which make this place a proverbial diamond in the rough. 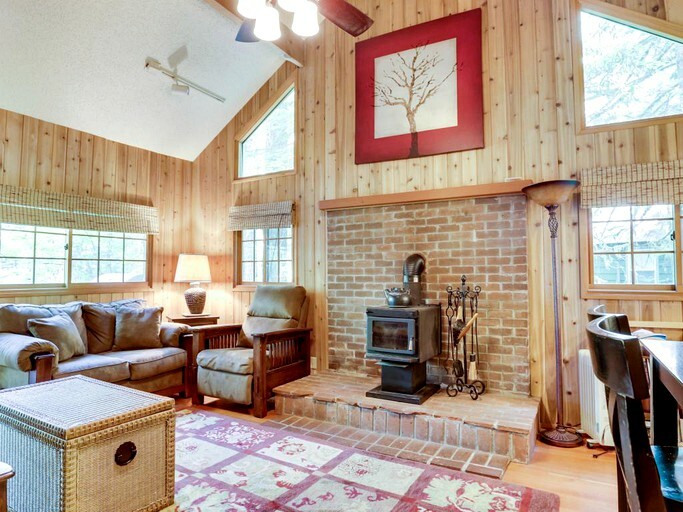 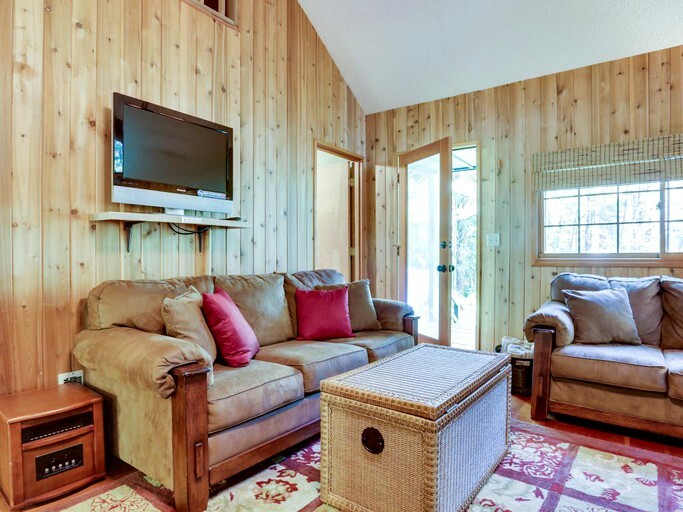 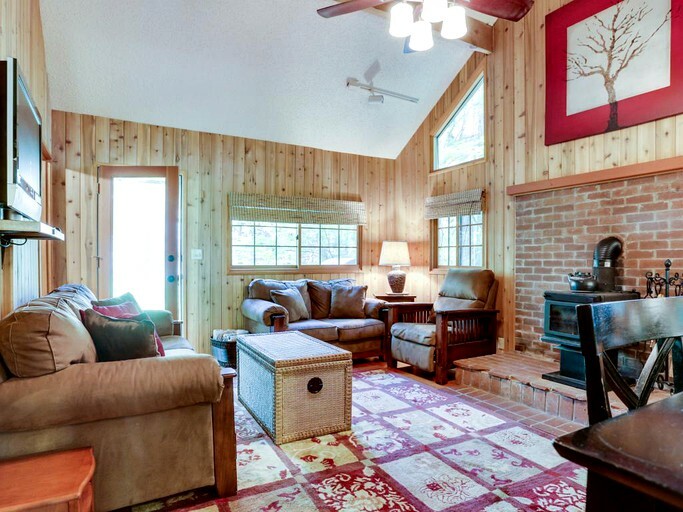 With vaulted ceilings, track lighting, large windows, and a cozy fireplace, the living area is great for relaxing. 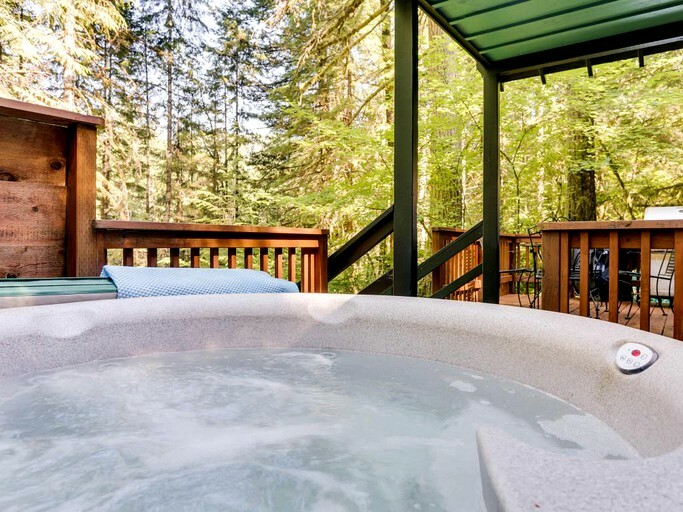 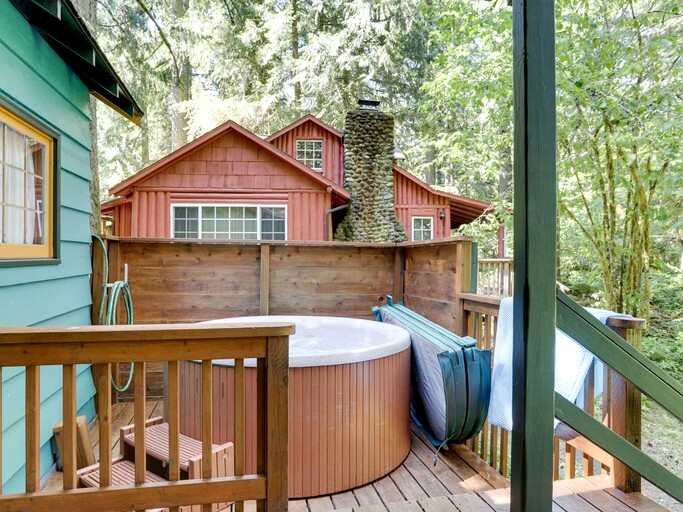 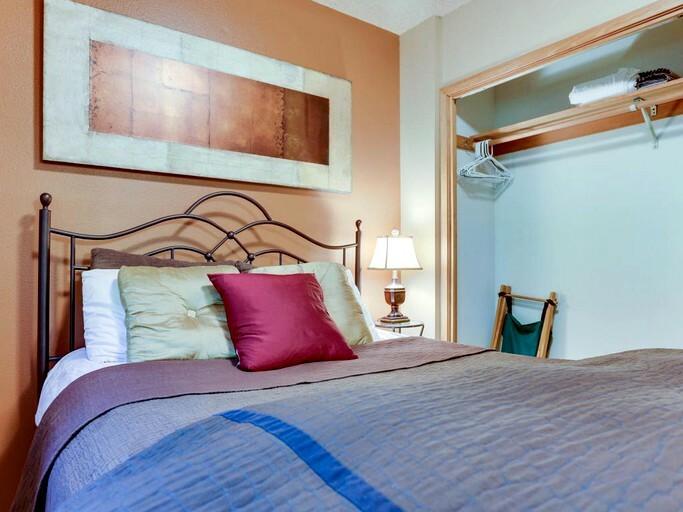 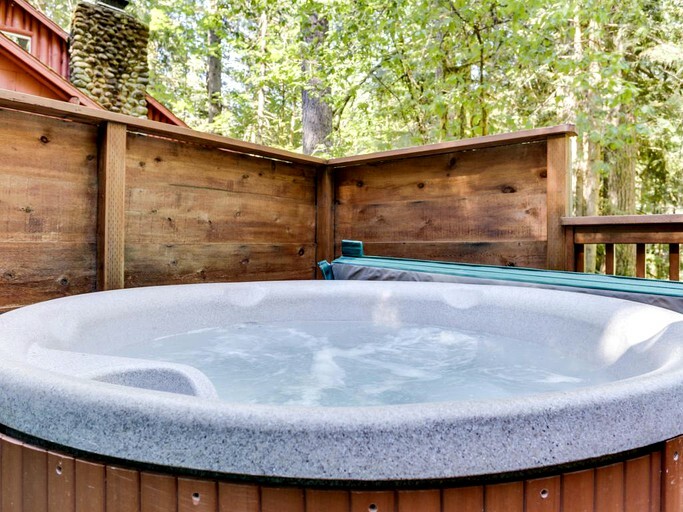 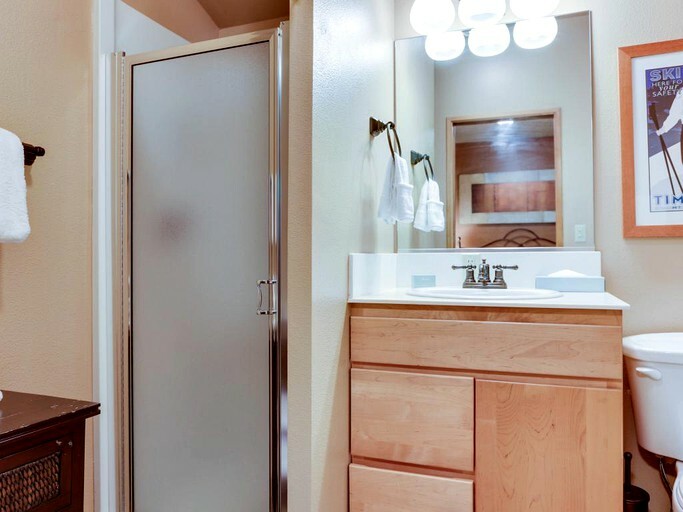 For entertainment, guests can watch a movie on the flat-screen cable TV or go outside to enjoy the private hot tub. 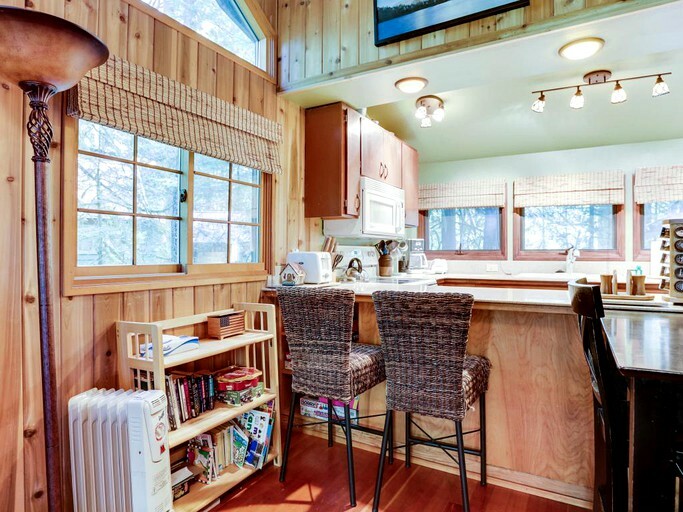 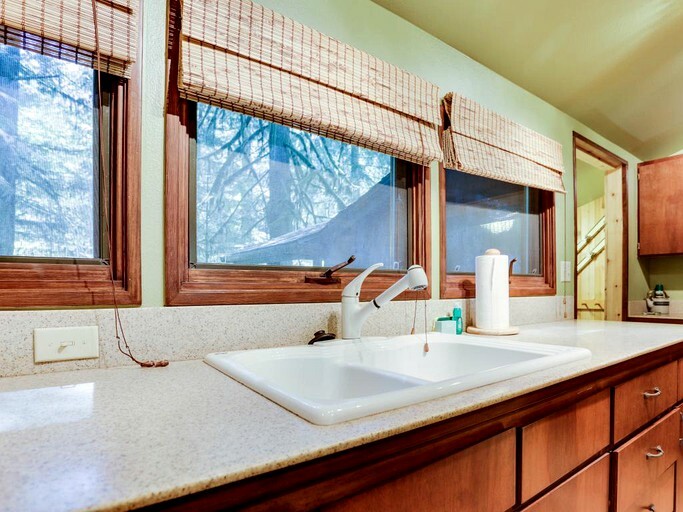 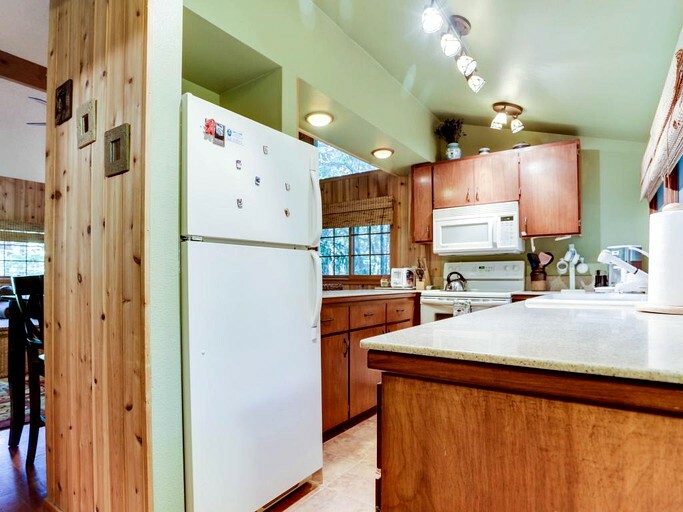 The kitchen is efficient and elegant with an up-to-date stove, fridge, and fixtures. 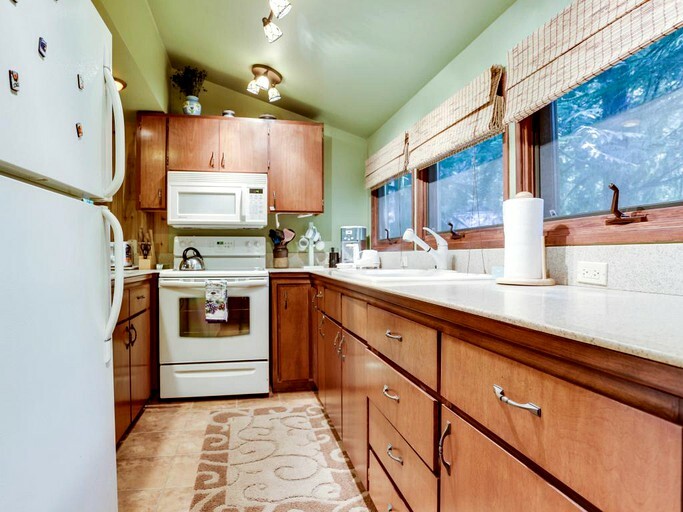 There’s a microwave, waffle iron, and coffee maker and grinder. 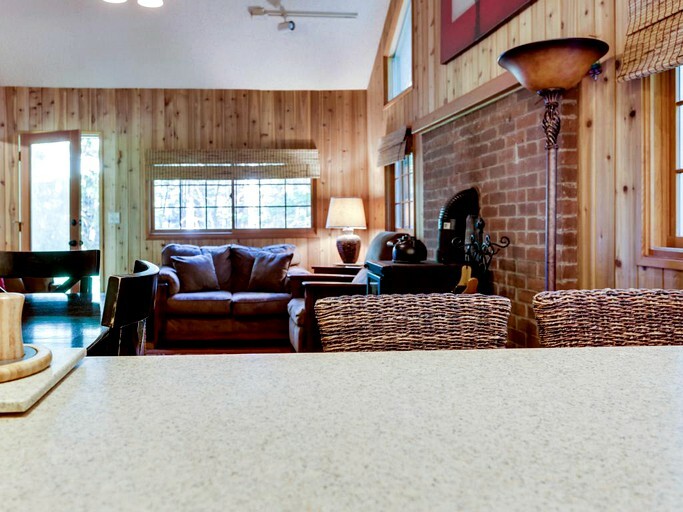 The lovely dining set has room for four guests. 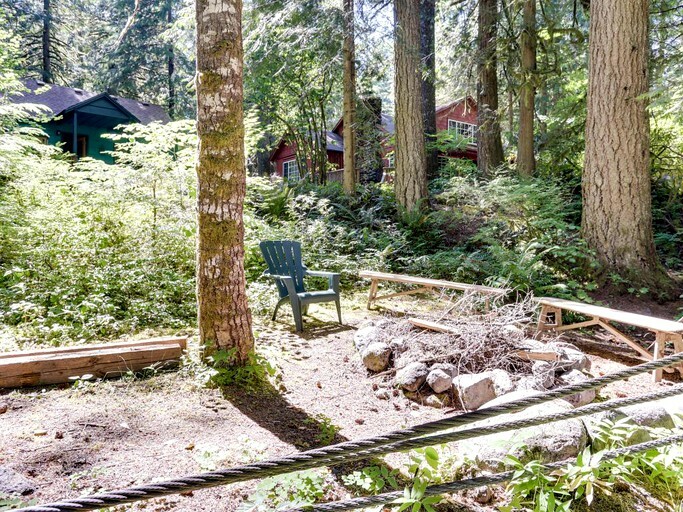 During the summer, the fire pit outside is great for toasting smores and enjoying the fresh mountain air. 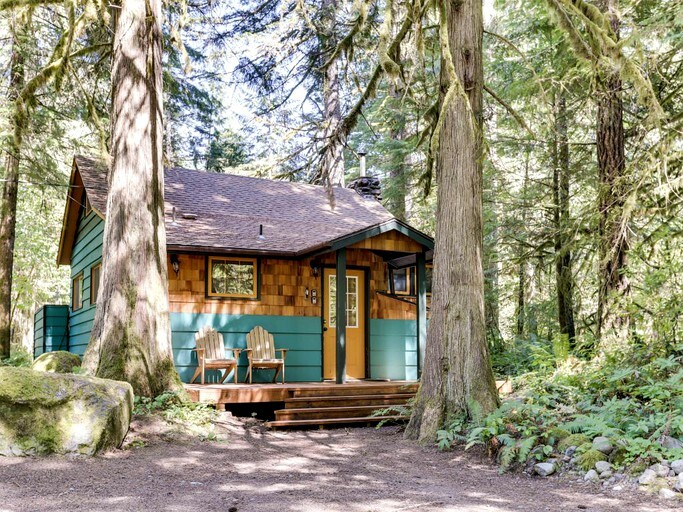 There are many activities in the Mount Hood National Forest because there are 60 square miles of forest, streams, and lakes, which means there are plenty of places to hike, bike, kayak, fish, and more. 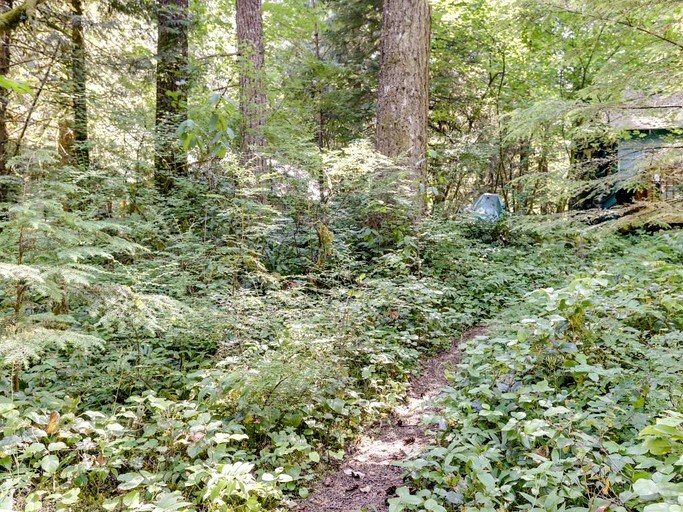 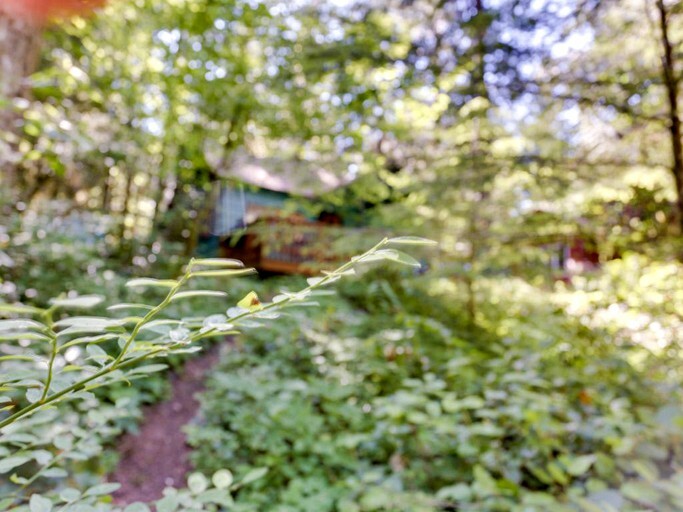 There are two of the official Oregon Cascades Birding Trails, making Rhododendron a go-to spot for ornithologists. 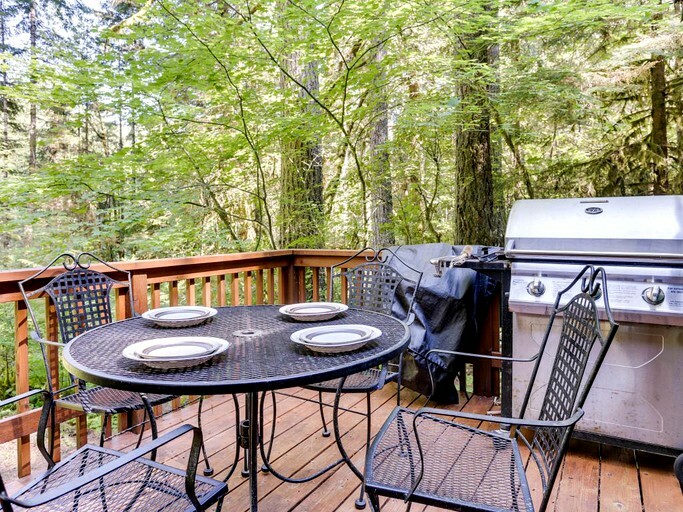 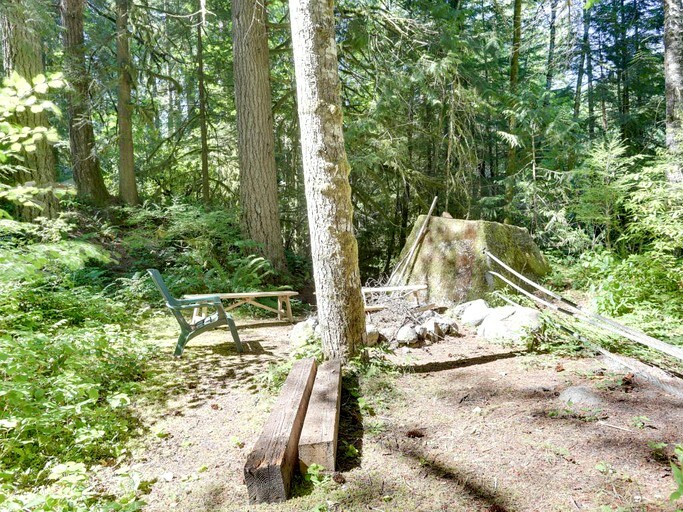 There are great sites for recreational activities in the Mount Hood area like world-class fishing. 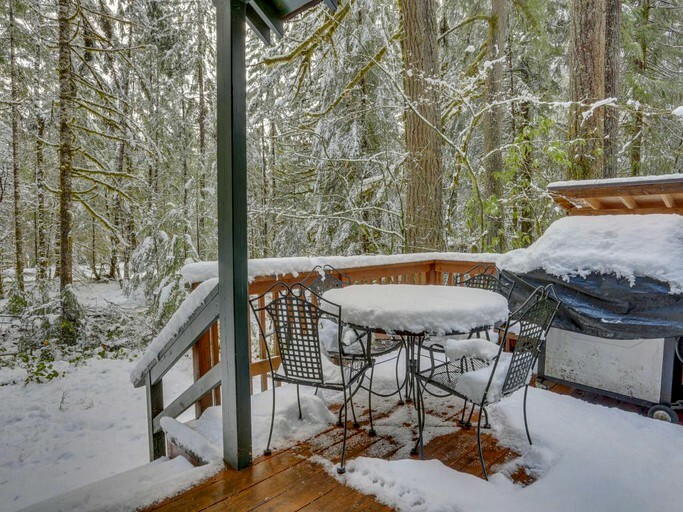 During the winter, the cabin is just 15 minutes to skiing at Skibowl and historic Timberline Lodge in nearby Government Camp. 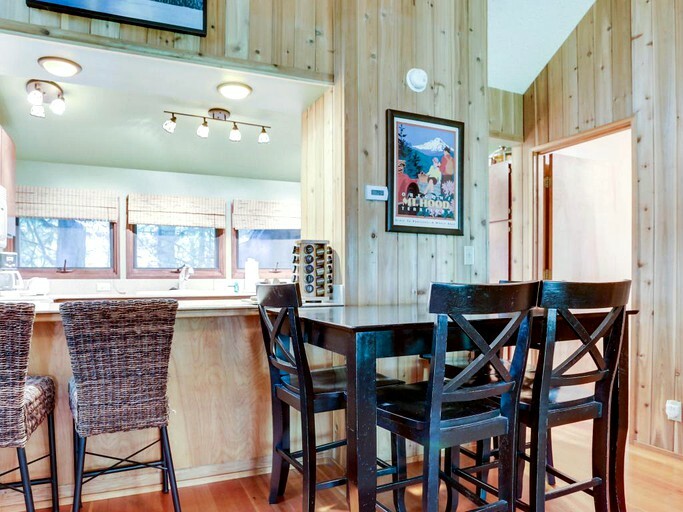 There are more world-class ski resorts in the area, too.